Del Norte County (/dɛl nɔɹt/) is a county at the far northwest corner of the U.S. state of California, along the Pacific Ocean adjacent to the Oregon border. As of the 2010 census, the population was 28,610. The county seat and only incorporated city is Crescent City. Del Norte was pioneered and settled by Azorean Portuguese explorers and dairy farmers, which may account for the local pronunciation of the county name. Residents pronounce the county name as Del Nort, not Del Nor-teh as would be expected in Spanish. Del Norte County comprises the Crescent City, CA Micropolitan Statistical Area. The rural county is notable for forests containing giant Coast Redwoods, with some attaining heights over 350 feet (110 m). This northernmost county on the California coast also has scores of unique plants and flowers, dozens of species of coastal birds and fish, rocky primitive beaches and sea stacks, pristine rivers, and historic lighthouses. Del Norte is also known among Bigfoot enthusiasts as the location of the famous Patterson–Gimlin film, as well as being the location of some of the forest scenes used in Return of the Jedi. The area that is now known as Del Norte was and still is inhabited by the Yurok (Klamath River Indians) and Tolowa Nations of indigenous peoples. The first European American to explore this land was pioneer Jedediah Smith in the mid-19th century. He was the first European American to reach the area overland on foot in a time before the European Americans knew anything about such a distant territory. For him it was literally "Land's End" — where the American continent ended at the Pacific Ocean. In 1855 Congress authorized the building of a lighthouse at "the battery point" (a high tide island on the coast of Crescent City) which is still functioning as a historical landmark. Del Norte County was established in 1857, from part of the territory of Klamath County following the great California Gold Rush. Klamath County itself ceased to exist in 1874. According to the U.S. Census Bureau, the county has a total area of 1,230 square miles (3,200 km2), of which 1,006 square miles (2,610 km2) is land and 223 square miles (580 km2) (18%) is water. The mountainous terrain associated with the Coastal Range and the Klamath Mountains dominates Del Norte County's geography. Elevation ranges from sea level to over 6,400 feet. Although much of the county is made up of steep terrain, there are small patches of flat terrain along the coast and in isolated mountain valleys. There are 37 miles of coastline in the county, forming a coastal zone that covers approximately 51,000 acres (80 square miles). A broad coastal plain can be found in the northwest portion of the county with the western edge of the Klamath Mountains as its easterly boundary. Rising abruptly from the coastal plain, the Klamath Mountains extend north into Oregon and are situated between the Cascade Range to the east and the Coast Range to the north. Klamath - one of the longest in California. Smith - a crown jewel of the National Wild and Scenic River program. Marshall Pond near the Klamath River, Redwood National and State Parks. There is a diversity of flora and fauna within Del Norte County. Vegetative plant associations feature several forest types including mixed oak forest. The California endemic Blue oak, Quercus douglasii is at the northernmost part of its range in Del Norte County. The Black Oak and Douglas-fir are also found in Del Norte County. The 2010 United States Census reported that Del Norte County had a population of 28,610. The racial makeup of Del Norte County was 21,098 (73.7%) White, 993 (3.5%) African American, 2,244 (7.8%) Native American, 965 (3.4%) Asian, 32 (0.1%) Pacific Islander, 1,980 (6.9%) from other races, and 1,298 (4.5%) from two or more races. Hispanic or Latino of any race were 5,093 persons (17.8%). As of the census of 2000, there were 27,507 people, 9,170 households, and 6,290 families residing in the county. The population density was 27 people per square mile (11/km²). There were 10,434 housing units at an average density of 10 per square mile (4/km²). The racial makeup of the county was 78.9% White, 4.3% Black or African American, 6.4% Native American, 2.3% Asian, 0.1% Pacific Islander, 3.9% from other races, and 4.1% from two or more races. 13.9% of the population were Hispanic or Latino of any race. 16.2% were of German, 11.3% English, 9.1% Irish and 7.4% American ancestry according to Census 2000. 91.6% spoke English and 6.2% Spanish as their first language. There were 9,170 households out of which 33.5% had children under the age of 18 living with them, 50.0% were married couples living together, 13.6% had a female householder with no husband present, and 31.4% were non-families. 25.3% of all households were made up of individuals and 10.1% had someone living alone who was 65 years of age or older. The average household size was 2.58 and the average family size was 3.08. The age distribution was 25.1% under the age of 18, 8.0% from 18 to 24, 32.2% from 25 to 44, 22.3% from 45 to 64, and 12.5% who were 65 years of age or older. The median age was 36 years. For every 100 females there were 123.3 males. For every 100 females age 18 and over, there were 130.3 males. The median income for a household in the county was $29,642, and the median income for a family was $36,056. Males had a median income of $40,072 versus $22,212 for females. The per capita income for the county was $14,573. About 16.4% of families and 20.2% of the population were below the poverty line, including 26.7% of those under age 18 and 8.2% of those age 65 or over. Del Norte County is home to a satellite campus of College of the Redwoods, a two-year college based in Humboldt County. Del Norte County has one of just five combined county office of education-unified school district learning educational agencies (LEA) in the state of California, with one elected Board of Trustees that serves both agencies, and one superintendent overseeing both the County Office of Education, and the Unified School District. The Del Norte County Unified School District provides public education to the children of Del Norte County through the twelfth grade. The only high school in Del Norte County is Del Norte High School, whose school mascot is the Warrior. There are also five K-5 elementary schools (Bess Maxwell, Joe Hamilton, Margaret Keating, Mary Peacock, Pine Grove), three K-8 elementary schools (Mountain, Redwood, Smith River), and one middle school (Crescent Elk). The County Office of Education provides special education services to the county, as well as alternative learning options that includes Community Day and juvenile detention. Alternative educational facilities are Bar-O Boys Camp, Del Norte Community Day, Elk Creek detention center, and Sunset Continuation High School. Del Norte County has several private parochial schools and charter schools. Del Norte is traditionally a strongly Republican county in Presidential and congressional elections. The last Democrat to win a majority in the county was Jimmy Carter in 1976; even so, Bill Clinton received a plurality in 1992. The county has almost an even split in Democratic and Republican voter registration. As of May 2008, approximately 67% of eligible voters are registered to vote in Del Norte County, with approximately 38% registered as Democrats and approximately 38% registered as Republicans, with the State of California reporting 32 more Republicans than Democrats on April 7, 2010. Third party affiliation accounts for approximately 6% of all registered voters in the county. Del Norte County is in California's 2nd congressional district, represented by Democrat Jared Huffman. In the State Assembly, Del Norte County is in the 2nd Assembly District, represented by Democrat Jim Wood. In the State Senate, the county is in the 2nd Senate District, represented by Democrat Mike McGuire. Local public transit is provided by Redwood Coast Transit, which provides access to Amtrak passenger train (via Amtrak bus) service. SkyWest Airlines conducts passenger flights to and from Jack McNamara Field Airport. The majority of flights connect to San Francisco International Airport through Arcata-Eureka Airport and vice versa, although a connection is also available to Sacramento. The Crescent City Harbor serves as a commercial fishing port for salmon, shrimp, tuna, cod, and dungeness crab commercial fishing boats. Nearly 50% of all dungeness crab served in California restaurants is off-loaded in this harbor. [citation needed] The harbor is also home to multiple fishing and non-fishing related businesses and harbor governmental offices. The harbor also has several pleasure boat docks. Crescent City is the county seat of and only incorporated city in Del Norte County. Its population count includes the inmates of Pelican Bay State Prison located ten miles north of the city. The population ranking of the following table is based on the 2010 census of Del Norte County. U.S. Route 199 in California, the Redwood Highway, at Jedediah Smith Redwoods State Park in Del Norte County, near Crescent City, California. ^ "Del Norte County". Geographic Names Information System. United States Geological Survey. Retrieved January 5, 2015. ^ "Bear Mountain". Peakbagger.com. Retrieved February 11, 2015. 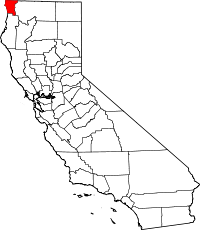 ^ a b "State & County QuickFacts". United States Census Bureau. Retrieved April 3, 2016. ^ Genzoli, Andrew (November 1971). "When the Portuguese Pioneered". Humboldt Historian. 19 (6): 8. ^ Roberts, Rich (April 10, 1991). "A California Time Capsule : Pristine Version of State Awaits in Smith River Recreation Area". Los Angeles Times. Retrieved 21 May 2016. ^ "Del Norte Fire Safe Plan" (PDF). Retrieved October 28, 2011. ^ Leip, David. "Dave Leip's Atlas of U.S. Presidential Elections". Uselectionatlas.org. Retrieved November 7, 2017. ^ "Members Assembly". State of California. Retrieved April 1, 2013. ^ "New airline flies as runway project takes off". The Curry Coastal Pilot. January 2, 2016. Retrieved 4 January 2016. ^ "2010 Census Interactive Population Search : Yurok Reservation". Census.gov. Retrieved 7 November 2017. ^ "2010 Census Interactive Population Search : Smith River Rancheria". Census.gov. Retrieved 7 November 2017. ^ "2010 Census Interactive Population Search : Elk Valley Rancheria". Census.gov. Retrieved 7 November 2017. ^ "2010 Census Interactive Population Search : Resighini Rancheria". Census.gov. Retrieved 7 November 2017. Wikimedia Commons has media related to Del Norte County, California.